I hope you’re hungry today. 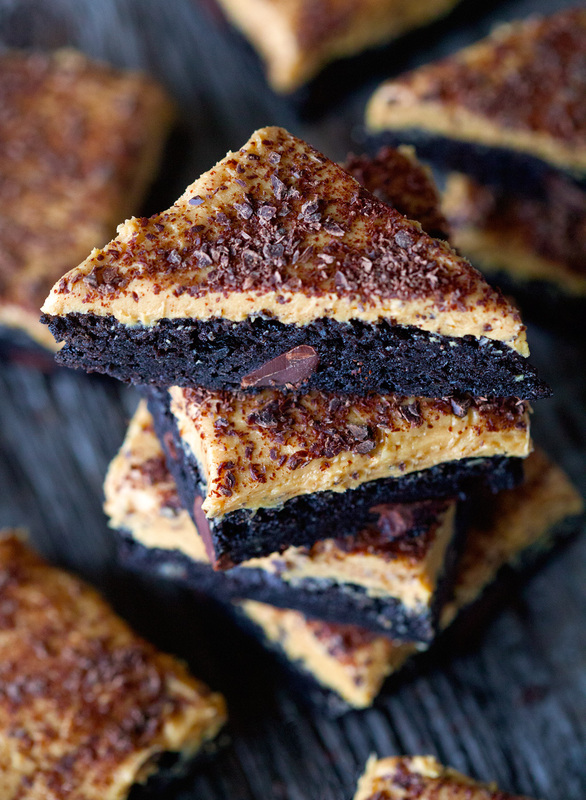 These brownies require a healthy appetite coupled with an incredible craving for chocolate and peanut butter. All I’ve been wanting to eat the last couple of days have been tomato soup and brownies. Odd? I think not. It makes perfect sense to me. These two things are what comfort food is all about. And believe me, we are in need of massive quantities of comfort and positive thoughts during yet another snow storm, scheduled to arrive tomorrow. Not only do I feel like I’ve earned the right to replenish my burned calories of snow shoveling with sweet treats, but I’ve been enjoying this winter in regards to what it’s done to my creativity in the kitchen. Some of the best desserts have emerged as a result of being snowed in all day. These brownies are definitely part of that group! 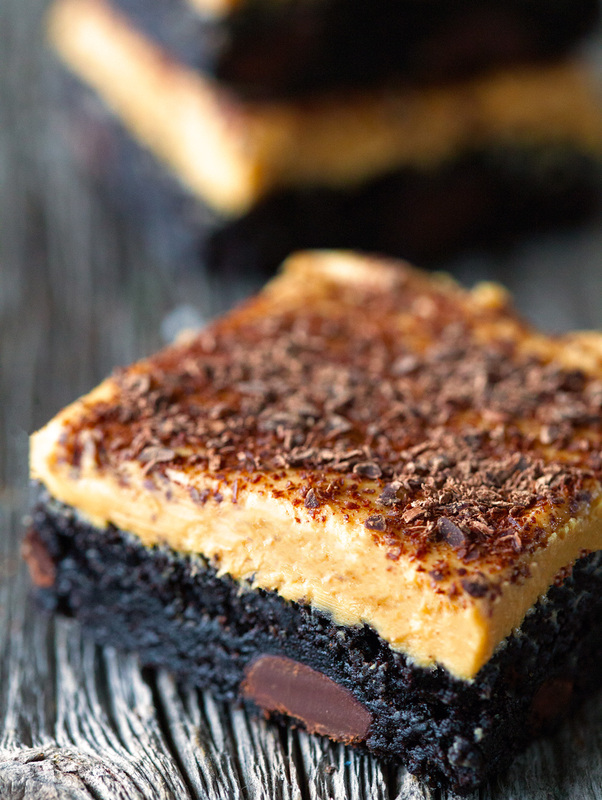 Now don’t get me wrong, I would happily trade winter coats, boots, and hats for t-shirts, shorts and flip flops, but who knows if this crazy peanut butter frosting to brownie ratio would have been born. That’s what I love most about these treats. 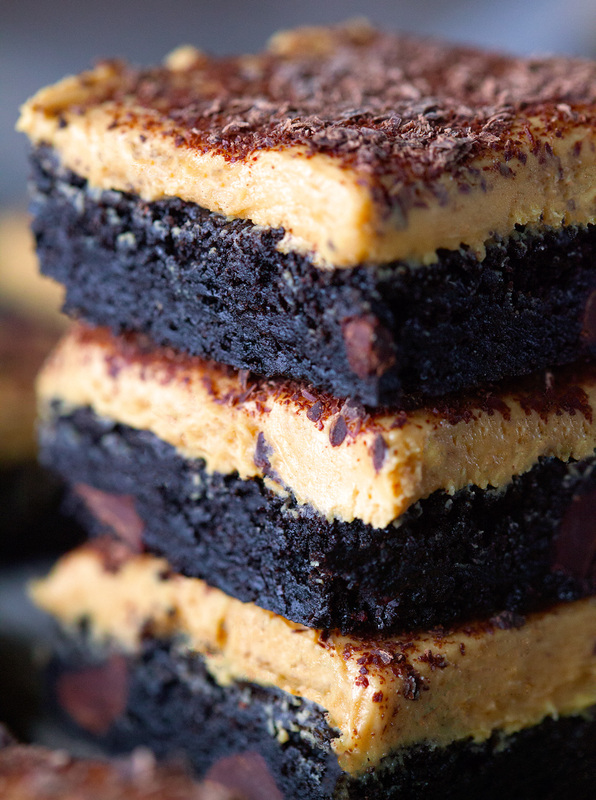 There are almost equal amounts of peanut butter and fudgy brownies in every bite. It’s as good as it’s gonna get, guys. And just so you know I am not actually enjoying this winter weather, I have buzzfeed to confirm that I was meant to live in summer and sunshine instead of whatever this is we’re experiencing. I actually caved and took the quiz everyone’s been taking entitled “What State Do You Actually Belong In” and lo and behold, I got Hawaii. This result didn’t really surprise anyone, ha. If you knew me close enough, you could have predicted the outcome :). And if you have no idea what I’m talking about, click here and find out whether or not you live in the right part of the country. Now back to these brownies. I prepared a batch of my Fudgy Brownie Recipe that I posted a while ago and made some minor adjustments. I switched out regular cocoa powder for special dark cocoa powder and used all butter instead of oil since I didn’t have any on hand. Worked like a charm. The peanut butter frosting comes together in no time and is easy as can be. Now you could stop here and omit the chocolate shavings, but why would you? Just kidding, go ahead and do whatever your heart desires… mine voted for chocolate shavings galore. I simply used my cheese grater and a bar of chocolate. Grate away until you have your desired amount. Super simple. I really, really think you’re going to love them! Happy Hump Day. Here’s the recipe for ya. Bake, share, and enjoy!! 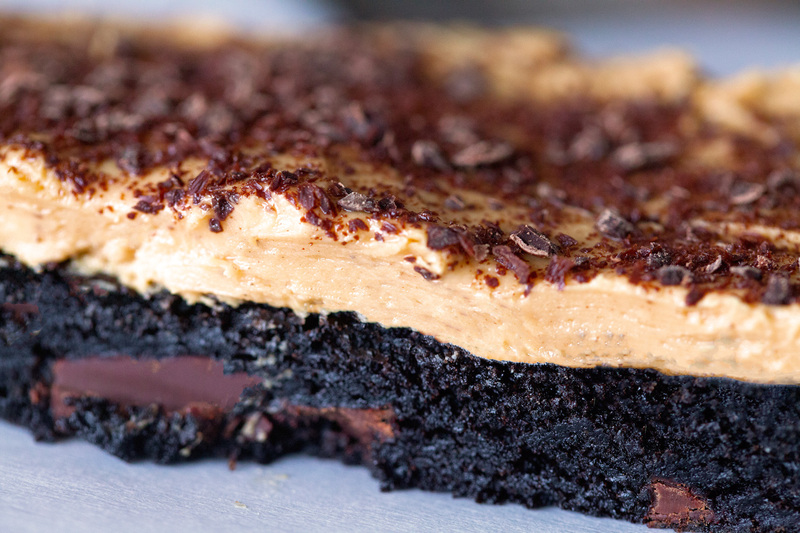 Calling all chocolate, peanut butter, and brownie lovers. You will fall head over heels for these. Being in love is quite delicious! Grease an 8x8 inch baking pan. Preheat oven to 350 degrees F. Set aside. 1. Start by making the brownies. In a large bowl, whisk together all the dry ingredients. Add the eggs, butter, and vanilla and combine until well incorporated. Add the chocolate chunks and stir. Pour the batter into the greased pan and put into oven. Bake for 35-40 minutes or until the brownies are set. Remove from the oven and let cool. Meanwhile, prepare the peanut butter frosting. 2. In a small bowl, mix together butter and peanut butter until smooth. Slowly add confectioners' sugar and mix until fully incorporated. 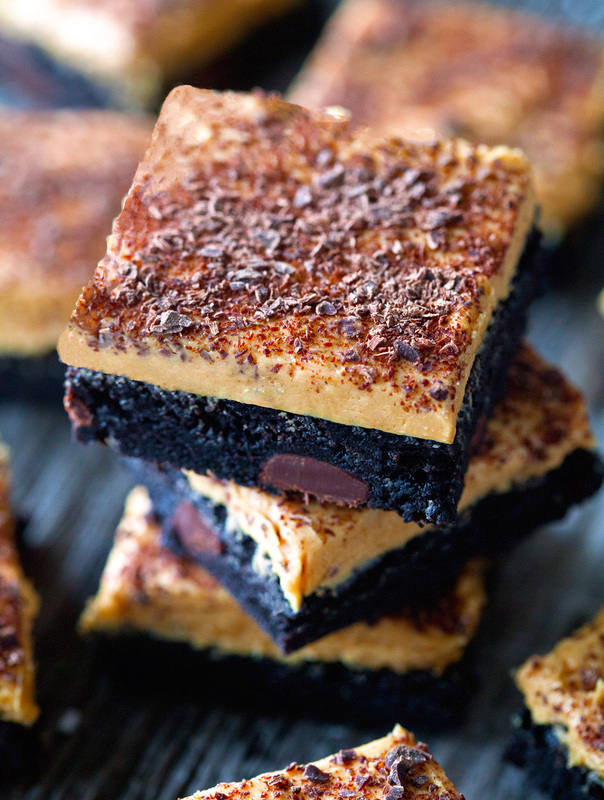 Once the brownies have cooled, spread frosting evenly over the top and using a cheese grater, grate chocolate over the top (as much as desired). Refrigerate for 30 minutes (it helps with the cutting) or until ready to serve. Brownies will keep up to 5 days in an airtight container in your fridge or up to 4 weeks in the freezer. Wow these look absolutely decadent! I could drive into one of those pictures! They definitely are, Julie! Thank you! 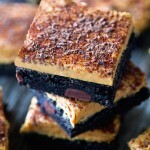 These brownies are the most incredible things I have ever seen! Pinned! You are too kind, lady! Thanks for pinning and the shout out on twitter!! OMG. I’m drooling!!! These are the best brownies ever! These are crazy good, Dorothy! It is so hard to keep these brownies around the house, ha! Aww, thank you so much, Natalie. I am so excited you’ve stopped by to say hi!! 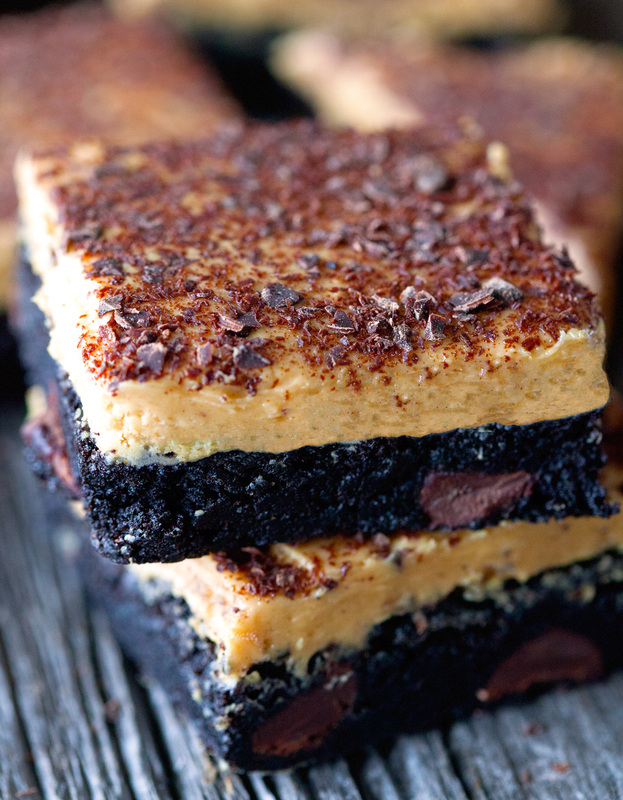 I always have an incredible craving for pb and chocolate! These brownies look to die for! You and me both, Chelsea :). Such a fabulous combination that never gets old! Just gorgeous Kathi! I am a total sucker for pb and chocolate 🙂 Pinned and shared on FB! Thank you very much, Trish. I am grateful you’ve stopped by and shared the love :). wow, they look so yummy!! I have to try this recipe soon! I hope you enjoy! Thanks, Diana. I’ll definitely check out your site! I am in fact Thankful to the owner of this site who has shred this post.